I know chili is pretty easy to make already, but when I was walking down the soup aisle I came across a package that read, “Darn Good” Chili. Perfect. It’s worth a try for the name alone. Is it “Darn Good” or not? Inside the package was an assortment of beans, rice and seasonings. No MSGs, no fat, and a pretty harmless-looking ingredient list. So, after adding some water and tomato paste, we will find out how “Darn Good” this chili really is. Pretty darn good in my opinion. Pretty darn filling as well. And cheap! Apparently this package makes 8 one cup servings. We don’t do it like that at my house, though. So we enjoyed going back to the pot for seconds. You can either semi-satisfy 8 people or completely satisfy 4. You’re choice. Either way, “Darn Good” Chili is a neat variety of beans and rice that will not disappoint your taste buds or hurt your pocket. 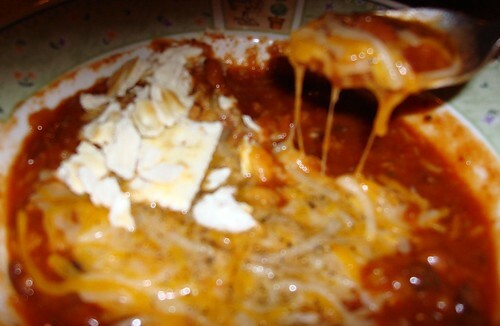 (but do add extra spice, if you like it hot…this chili is very mild flavored) And although no one flavor in the mix stood out strongly on its own, the medley of flavors create a “Darn Good” combo. And the package only costed $3.99 plus a can of tomato paste. 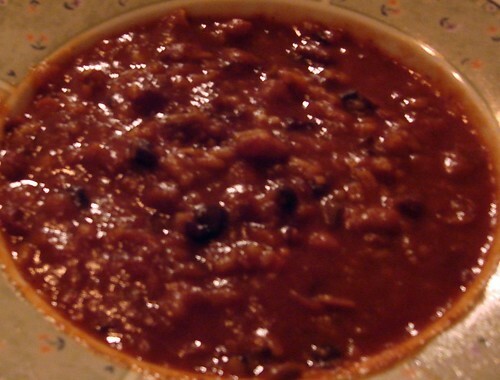 Sure, it isn’t the best chili you’ve ever eaten, and I would recommend making homeade chili on most days, but for a camping trip, feeding large groups cheaply, convenience or storage purposes “Darn Good” Chili is the perfect candidate. 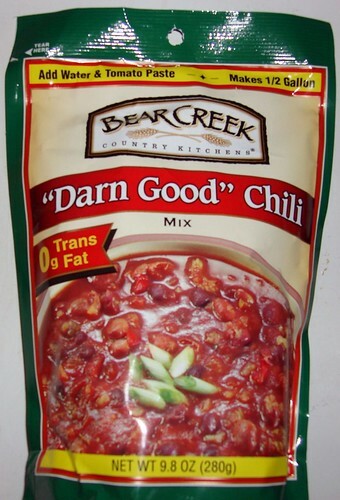 Overall, you can’t feel very guilty since “Darn Good” Chili is not unhealthy for you or your family, nor is it costly. 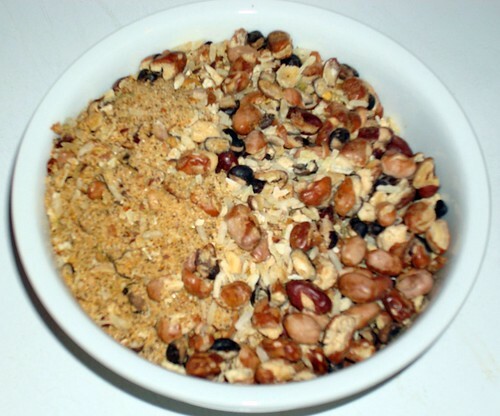 Extra ingredients are not necessary for a tasty bowlful, but adding meat could stretch the batch even further. I’m definitely going to stock my cupboard with a couple packages of “Darn Good” Chili, for those nights when I just don’t know what’s going to be for dinner. In conclusion, I’m going to share with you the only real way to eat a bowl of chili. Alert to the weak-stomached do not proceed…anyone else can see the messy truth here. This entry was posted on Thursday, October 23rd, 2008 at 8:16 pm	and is filed under dinner, review. You can follow any responses to this entry through the RSS 2.0 feed. You can leave a response, or trackback from your own site. i ran across this[[ bear creek ]] brand also , so easy and wow is it good, i’m gonna try all the packages , cause i love to cook, as i did in the NAVY . the gumbo is next . Howdy very cool web site!! Man .. Excellent .. Wonderful .. I will bookmark your web site and take the feeds additionally?I’m satisfied to search out a lot of useful info right here in the put up, we want work out more strategies in this regard, thanks for sharing. . . . . .
Estoy feliz de encontrar webs donde hallar informacion tan util como esta. Gracias por facilitar este articulo. Es un alivio encontrar a alguien que realmente sabe lo que están hablando en la red . Obviamente, que sabes cómo llevar articulo a la luz y que sea didáctico. Más internautas tiene que leer esto.